In the latest leak from the company, Samsung has accidentally released an advertisement for the Galaxy Note 9. The news comes from the tipster twitter handle, Ice universe. The account shared a photo of a full-page ad of the Galaxy Note 9. The page advertises the Note 9 as “The new super powerful Note 9”. Not sure where Samsung was going with that but the overall design of the smartphone though not new, still looks impressive. What is expected to be new, is the revamped S-Pen which will now feature Bluetooth capabilities. A Galaxy Note 9 design render video was posted on YouTube. The video shows an elegant design which follows the same design pattern as the Galaxy Note 8. The only noticeable difference is the placement of the fingerprint sensor, which sits right below the rear-camera module. The color variants suggested by the video are Onyx Black, Navy Blue, Lilac Purple, and Brown Gold. 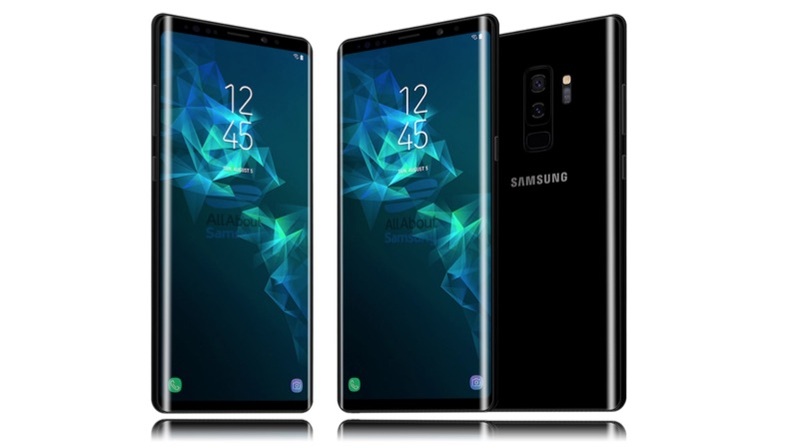 The Galaxy Note 9 might have a 6.4-inch Super AMOLED display with 1440 x 2960 px resolution and an aspect ratio of 18.5:9. The pixel density for the Note 9 could peak at about 514 ppi. The display will be protected with Corning Gorilla Glass 5. The SoC for the Note 9 could vary from region to region. For instance, EMEA (Europe, the Middle East, and Asia) may see a Galaxy Note 9 with an Exynos 9810 octa-core chipset. Four of these eight cores will run at 2.7 GHz and the other four at 1.8 GHz. The second variant could launch with a Snapdragon 845 SoC, for USA and China. The camera setup for the Galaxy Note 9 may feature dual rear-mounted sensors. The rear-camera setup is speculated to have a 12MP sensor with an aperture of f/1.5 and another 12MP sensor with f/2.4 aperture. This flagship may also feature an 8MP front-facing camera. The primary sensor could have OIS capabilities and 2x optical zoom. Samsung has been lagging behind the competition for a while. Especially after massive a sales dip last year. All eyes are glued to Samsung as the Galaxy Note 9 release is around the corner. Stay tuned to iGyaan for further updates.